Is there a document somewhere that has examples of traces and then a description of either whats correct or wrong? like an image of a simple circuit printed as perfect as possible, and then the same circuit printed with too much and too little conductor or the head too high or low. I think my traces are okay most of the time but I'm not sure what I can do to make them better or if that's as good as they can be. What an excellent request. Unfortunately, a little bit of intuition is required to get good quality prints, but once you develop it you will get a perfect prime in seconds. There are two key parameters that dictate your trace quality: your flow rate and your print height. This is the amount of ink that flows out of the nozzle when printing. Too much ink will lead to shorts and potentially a broken nozzle. Not enough ink will lead to open circuits. The flow rate is determined by the position of the plunger inside the syringe. Every time you click the + or - buttons you adjust this parameter by making small rotations to the gears. This is the gap between the substrate and the tip of the nozzle. The software takes the probing data into account and makes micro adjustments as it moves across the bed to maintain a constant height. The default height is 0.1 mm for the silver ink and 0.14 mm for solder paste. The following videos illustrate common problems during printing. Printing too high or flow rate too low. The ink does not adhere to the substrate. It balls up on the tip of the nozzle and gets periodically deposited on the substrate in clumps. Ensure your height is set to 0.100mm and increase the flow rate. If this behaviour persists then the nozzle might be clogged or the ink might be too cold. Wait until the ink reaches room temperature and try rotating the gear by hand to purge some ink and get good flow. A little bit subtle but if you look closely, the ink adheres to the substrate but the trace shape doesn't quite match the motion of the nozzle. The traces will also be very narrow and tall. It's possible you have some dried ink on the limit switches that are throwing the calibration off. Make sure to clean the limit switches. You may want to force the printer to re-calibrate the height. This is dangerous territory and a broken nozzle is usually imminent. If you are printing too low the ink will be getting smooshed by the nozzle, and the traces will be as wide or wider than the nozzle. You will also start to see the substrate through the the traces. Assuming a height of 0.100mm, you should stop the print and force the system to recalibrate the height. If you release the motors (Alt + R) when the machine is stopped, it will re-calibrate the next time it starts printing. If this problem persists then you might have a damaged probe. A small gap is seen in a trace during printing, but the nozzle never raises or stops. When you install a brand new nozzle, air bubbles typically escape during your first print. If you encounter one of these, you may re-print the problematic area by selecting it in the print preview. Like Goldilocks and the three bears - This is what you are after. The traces are well defined and track the nozzle well. Print height and flow rate are tied together. If you increase the print height you need to increase the flow rate and vice versa. During a print I recommend keeping your height constant and only make adjustments to your flow rate. If you need smaller increments in flow rate then clicking the Advanced link will allow you to select your adjustment size. Hopefully this post helps get some intuition. I'm happy to provide more examples. That's a great guide, thanks! I think I only have one more question. Is it normal to have gaps in traces like in the image below? or is this still a backlash issue? Ive ran the backlash correction once already. In particular I'd say that is side of this board is one of my best prints all in all though. Jesus/Matt, So I know this board isn't aligned well enough for a serious print but I am still struggling a bit with getting paste down satisfactory. For the larger pads it is more the shape I am concerned with. One the .5mm spaced pads what are your recommended settings? Getting gaps in the traces could be a backlash issue, especially if you're seeing gaps in diagonal traces. If you're confident that the backlash correction is correct though, then it's likely something else. Based on the gaps you're getting in the pads (highlighted in the image below) and the 'wobbly' texture of some of the traces, it could be a an issue with height calibration. Note that typically you shouldn't need to increase or decrease your height to get a good print - if you find that you need to change it more than 0.02mm, something is probably up. A common cause could be if the dispenser or probe are moved on or removed from the carriage after the V-One has done the initial position calibration (where the dispenser /probe tip triggers the 4 switches) - if this happens, you need to reset the calibration by forcing a motor release with Alt+R, as described in the guide posted above. If that's not the case, and you happen to find that you need to constantly increase your flow during printing, I'd suggest having a look at the conductor cartridge, and checking to see if there is conductor that has breached past the piston. If you still happen to see these kinds of issues, one thing you can try is to reduce the feedrate to 400 mm/min in the settings window and re-calibrate. That may help if you're seeing a lot of wobble or gaps in the traces. You're right that the shape is definitely a bit off. The hourglass shape implies pooling at the start and end. Just to check, can you post an image of the pad toolpath? I suspect it could be a height calibration issue, as described in my response to pathare above. In general for the 0.5mm pads, I'd suggest printing a bit less paste than usual. Start by using selective print to calibrate only the 0.5mm pads, and try to reduce flow by increments of -10 until you're getting a small, fine line. If you're unable to do so, reduce print height a bit to 0.12mm. 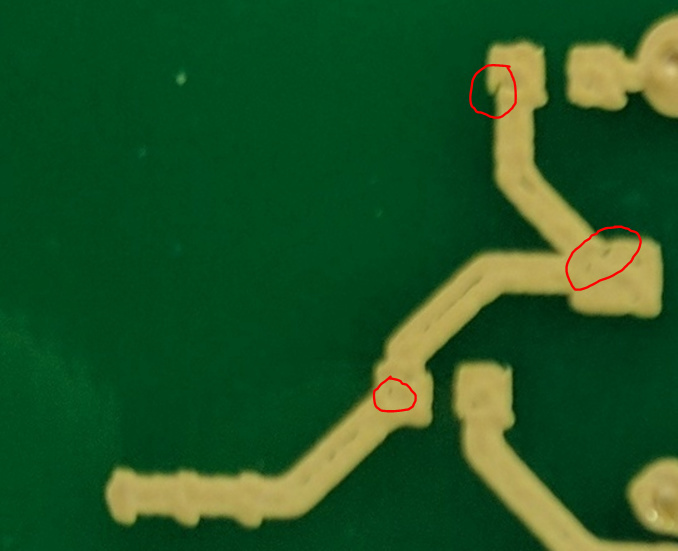 It can happen sometimes that infill on larger pads may suffer a bit at very fine trace widths, though solder paste is pretty forgiving in these cases. If it's a big concern, one thing you can try is to reduce your pass spacing a bit to 0.15mm in the settings window - this will increase the number of passes in the larger pads. 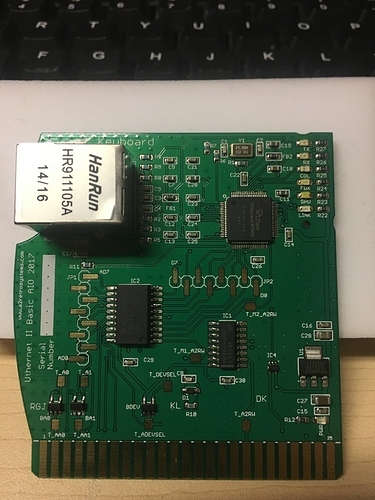 Hi Matt, it took some experimentation but I finally got a reasonable application of solder paste on all the pads. 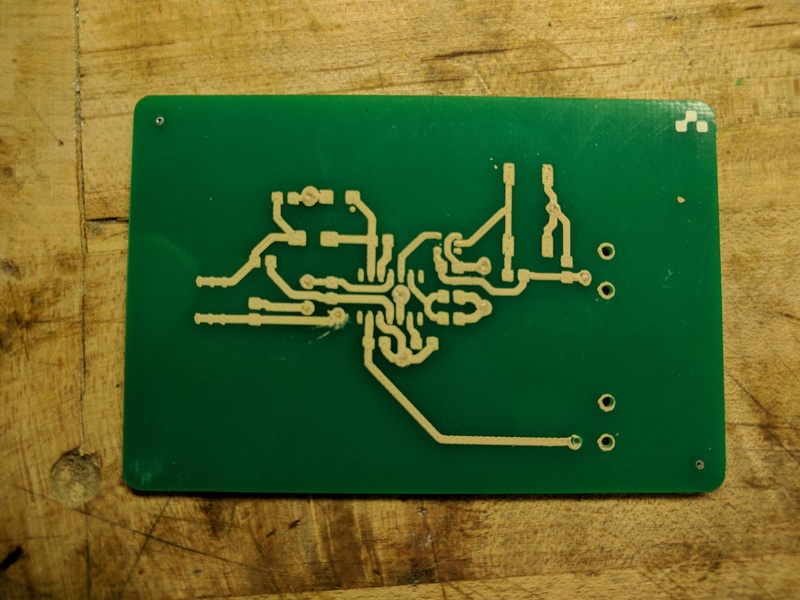 I decided to bake this in my regular PCB oven as I wanted more control over the process. Next time i will try a V-One bake. Your paste seems to start melts at a much lower temperature then the solder paste I am used too. Do you remember what you ended up doing to get good results? I was able to unplug mine by soaking it in acetone for a while, then using a syringe (like for medicines - no needle) to force acetone through it. Let it dry before use!